Rhaphiolepis is a genus of about fifteen species of evergreen shrubs and small trees in the family Rosaceae, native to warm temperate and subtropical eastern and southeastern Asia, from southern Japan, southern Korea and southern China south to Thailand and Vietnam. In searching literature it is well to remember that the name commonly is misspelt "Raphiolepsis". The genus is closely related to Eriobotrya (loquats), so closely in fact, that members of the two genera have hybridised with each other; for example the "Coppertone loquat" is a hybrid of Eriobotrya deflexa X Rhaphiolepis indica. 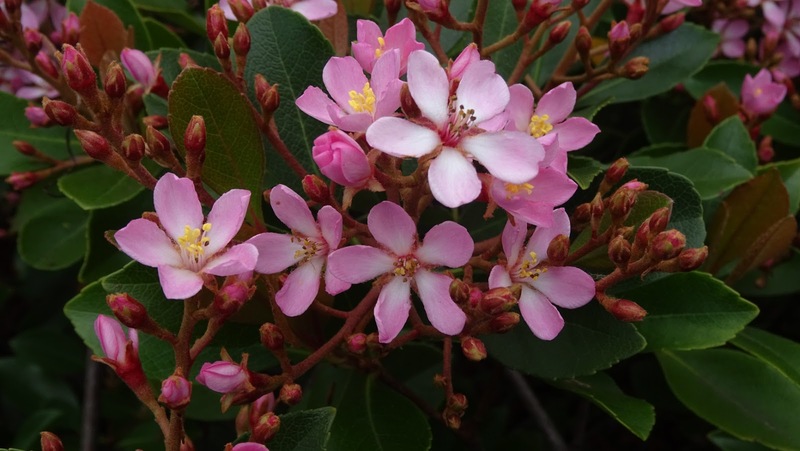 The best known species is Rhaphiolepis indica (Indian hawthorn) from southern China, grown for its decorative pink flowers, and popular in bonsai culture. Rhaphiolepis umbellata (Yeddo hawthorn) from Japan and Korea has blunter leaves and white flowers. It is the hardiest species, tolerating temperatures down to about −15 °C. Its fruit is edible when cooked, and can be used to make jam. Indian hawthorn is a mainstay horticultural specimen in temperate climates. It is often found in commercial as well as in private landscapes. Often it is trimmed into small compact hedges or balls for foundation plants. It has been successfully pruned into a standard form as well as small dwarf-like trees up to 3 metres in height. It is apt to develop leaf spot. Add your own link to the Linky list below and say hello in a comment. Please visit other participants in the meme. Nick, magnificent shrub. Thanks for sharing. Thanks for the link to the poem, never read before, but I like it. Hi Nick, thanks for coming to my blog! We have hawthorn trees here but this one looks so lovely with those flowers. I put in some flowers for you from Butchart Gardens.